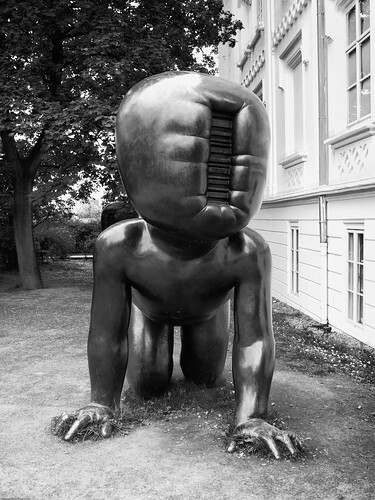 There’s a museum, which was not open when we went by, but we did enjoy the three disturbing faceless baby sculptures in their garden. 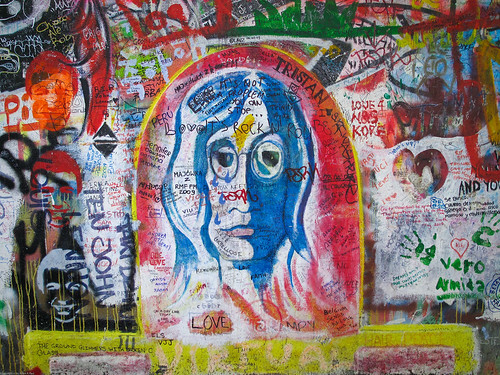 We were here first because it is a short walk from Malá Strana, and second because the “Lennon Wall” is located here. 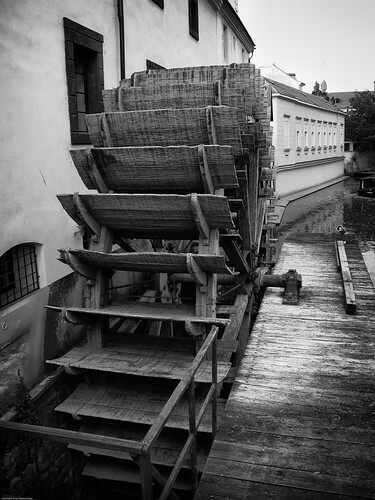 On the western shore of the island is a narrow channel, formerly studded with waterwheels to power various things that needed power. Now only one (above) remains. 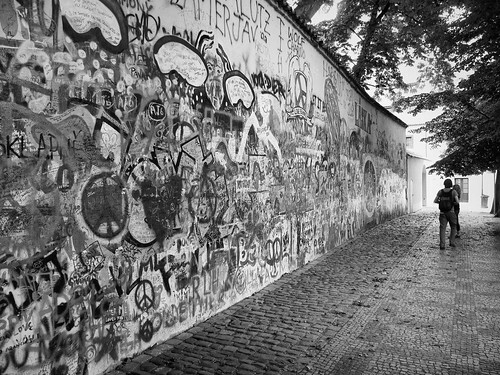 Once a normal wall, since the 1980s it has been filled with John Lennon-inspired graffiti and pieces of lyrics from Beatles songs. 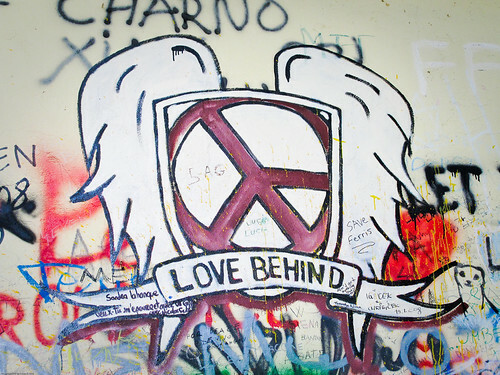 Young Czechs would write grievances on the wall and in a report of the time this led to a clash between hundreds of students and security police on the nearby Charles Bridge. 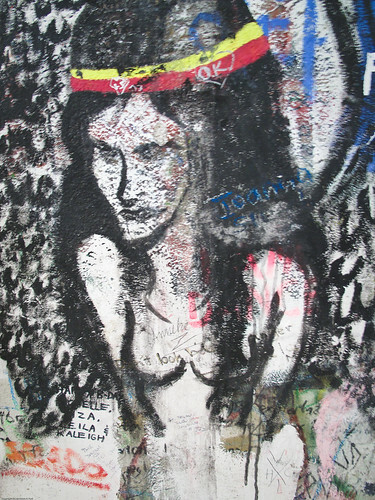 The movement these students followed was described ironically as “Lennonism” and Czech authorities described these people variously as alcoholics, mentally deranged, sociopathic, and agents of Western capitalism. 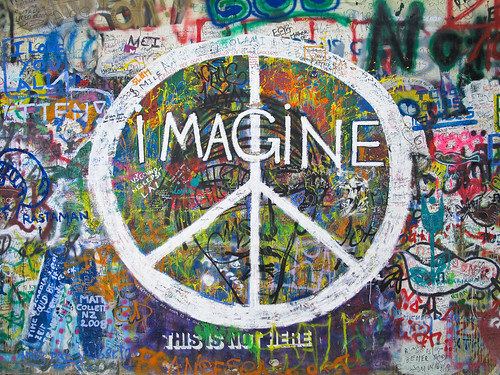 I admit to an admiration for many (non-tagging) types of urban graffiti, and we enjoyed walking the length of the wall and taking in the many images of peace, thinking of what it must have been like here when such messages were considered “subversive” and subjected one to arrest. 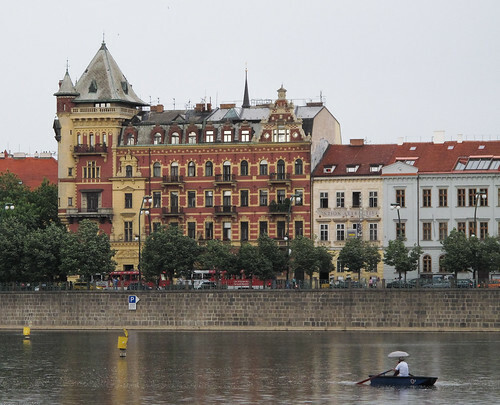 We finished our walk on the shores of the Vltava, refreshed by a light rain, and made our way back to our hotel. This was a fun diversion from the typical tourist activities, and since it’s so close, I’d recommend it to anyone. A wonderful area of Prague. In fact, some of its buildings are the header photo of my blog. You really saw a lot while you were there! 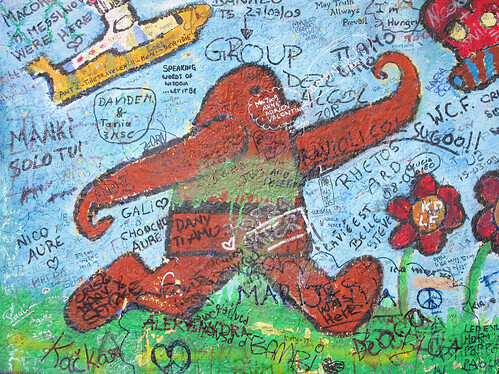 Oops I appear to have missed this comment – Mala Strana was our favorite part of Prague, and judging by some of your posts, you were fond of it as well, Jenna. Hi Adam! 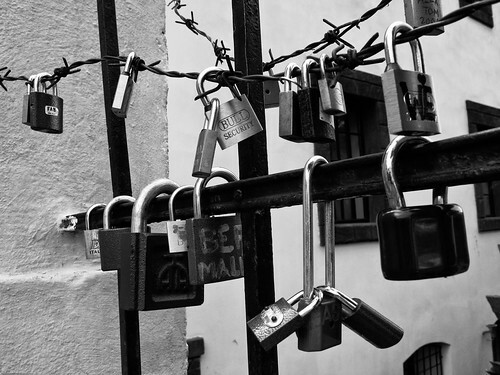 I stumbled across your blog while searching for itineraries and places to visit in prague for my upcoming honeymoon. I must say that what you’ve shared is truly a valuable resource! I love your pictures & your annecdotes! Thanks much for the kind words, CY – I’m glad you’ve enjoyed my posts, and most importantly, congratulations on your upcoming nuptials!